Postmaster-General (and later Prime Minister) Joseph Ward had a plan to place New Zealand in the forefront of civilised countries in the world, by reducing postage charges for letters to one penny from New Zealand to almost any country in the world - Australia, the United States, France and Germany were among those countries who would not accept such letters, fearful of having to reduce their own postal charges to match. Most of the countries who would accept the letters did so without offering reciprocal postal rates. This also halved the cost of mailing letters within New Zealand. On New Years Day 1901, the first day of the 20th century and normally a bank holiday in New Zealand, Post Offices around the country were open for the initial launch and within half an hour of opening, the Wellington Post Office had sold around ten thousand of the stamps. Concern was raised in Government circles that Post Office revenues would fall substantially with the reduction in postage rates, but mail volumes increased sharply and 13 million more letters were sent in 1901 than in 1900. This increase in mail volume meant that by 1902 any loses had been recovered. 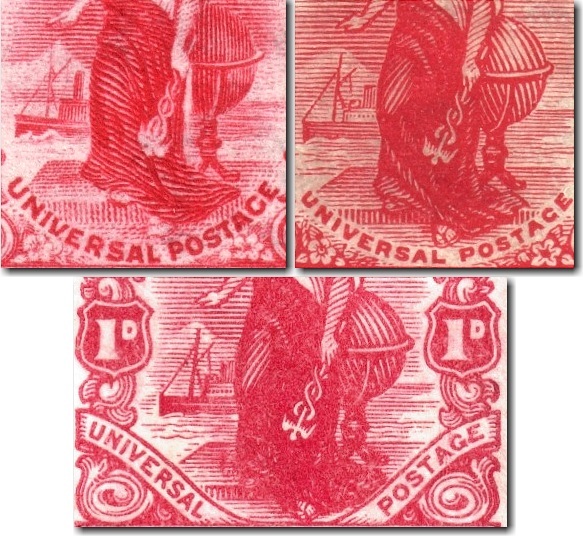 The stamp was recess printed until 1908 when it was replaced by the surface printed Redrawn Pictorials. As well as the sheets of 240 stamps, stamp booklets were manufactured and sold for the first time containing 12, 24 or 30 stamps in panes of six with a halfpenny surcharge to cover the extra production costs. Special coils of stamps for a prototype stamp vending machine installed at the General Post Office in Wellington were printed - these were a world first. 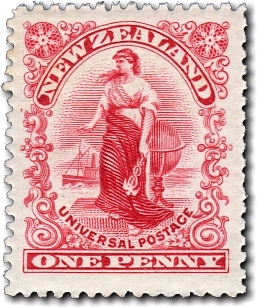 The stamp bears the female figure of 'Zealandia', intended to become a figure of national personification representing New Zealand in much the same way as 'Britannia' represents the United Kingdom. In the background a mail boat is shown steaming past Mount Egmont / Taranaki. There are three different designs of the penny universal postage stamps which are easily confused. The 1901 Penny Universal (top left) has vertical shading on the globe. The wake at the bow of the steamer is also far more impressive on the 1901 Penny Universal than later designs. The 1909 King Edward VII 'penny dominion' (bottom) has a similar design to the 1907 Redrawn Pictorials penny (top right) with 'Dominion of' added at the top of the stamp and 'universal postage' appearing on a scroll at the bottom of the stamp. Both the 1909 King Edward VII dominion and 1907 Redrawn Pictorials penny stamps have diagonal shading lines on the globe behind the figure of Zealandia.